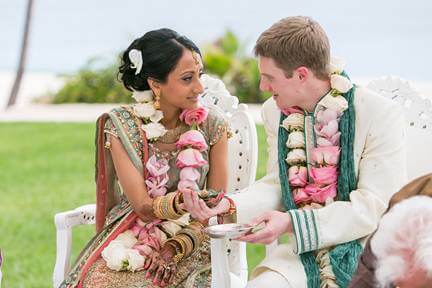 Traditional Indian wedding-day hair and make-up is bold and vibrant. 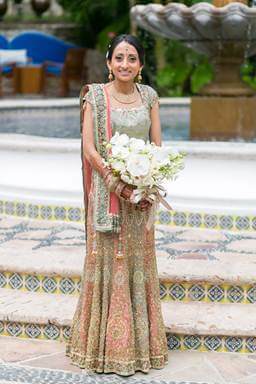 We’ve styled many Indian brides in the past, and it’s one of our favorite looks because there are so many fun ways to achieve that dramatic beauty. Indian bride Hetal came to us with something different in mind for her wedding-day look, and we were so impressed by the results we just had to feature her natural, classic Indian hair and make-up here on the blog! 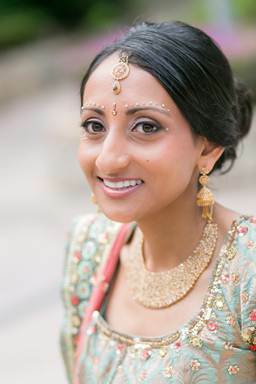 Hetal’s wore traditional intricate Indian clothing for her wedding-day, but she wanted her hair and make-up to look simple and on the natural side. 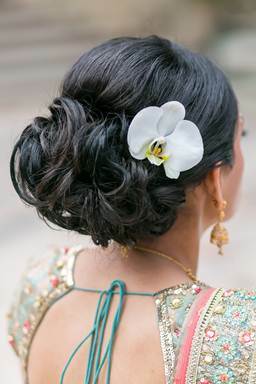 We styled her hair in a chic up-do with a single flower piece. Her make-up featured well-defined brows with pale pinks on her eyes and lips, allowing her beautiful jewelry and elaborate dress to shine on her big day. A huge thanks to Arianna Campo for coordinating this beautiful wedding, and to Pina Hernandez for the breathtaking flowers. This entry was posted in Cabo Bridal Hair and Makeup and tagged Cabo bridal salon, Cabo Indian bridal makeup, Cabo Indian wedding, Cabo wedding hair and makeup, destination wedding hair and makeup, Indian bridal hair, Indian destination wedding, Indian wedding makeup, Indian wedding updo, natural Indian wedding makeup, One and Only Palmilla, Pina Hernandez, Suzanne Morel, traditional Indian wedding.